The extremely good blog by Tony Karon: Rootless Cosmopolitan, publishes on May 2, "The Blind Spot in Israel's War Probe". What is the blind spot? It is the US intervention into Israeli politics and warfare during the Summer War of 2006 against Lebanon. The first part of the official report of an Israeli government-appointed commission about that war was published some days ago. It deals with the first five days of that catastrophic event. Calls for Israeli Prime Minister Olmert to step down are as yet unheeded, but a Tsipi Livni ultimatum (today, May 3) will probably do the job. How many foreign Friends of the Bush administration's casualties will add up, before there will be put an end to it? Olmert will for sure have to step down. He will neither be the first-, nor the last one of the leading politicians of a number of countries who'll have to pay a heavy penalty for their trust in Bush. Blair with Balkenende, April 2007: Both will have to step down, sooner or later, because of their alliances with Bush. Tony Blair, the British prime minister, will be the next one after Olmert. He announced that he will fix a date for his abandonment of power in Great-Britain one of the next days. Former victims of loyalty to Bush were Spanish prime minister Aznar and Italian prime minister Berlusconi. 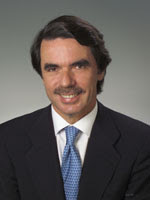 José Aznar, staunch supporter of Bush. Was ousted as PM in Spain in 2004, after lying about the background of the 11/3 terrorist murders in Madrid. Is now a featured speaker of the Washington Speakers Bureau. Silvio Berlusconi, Italian Prime Minister. Was outraged as he was NOT invited to the Madeira conference in March 2003. A top secret agent of the Italian SS was killed by American soldiers in 2005. His distancing from the US afterwards did not help him: He lost the 2005 elections to Prodi, who retired all Italian military from Iraq. A holocaust of falling heads of government accompanies the sunset of the Bush administration. Ironically, while Bush started his tenure with the objective "to take out Saddam", his list of persons taken out is populated mostly by his friends. In the US, we should mention Powell and Rumsfeld, Tenet and Harriet Miers. Although the latter never had a chance. John Bolton had to be added to the list a year later. Tenet, former CIA director, who took his distance from Bush and Cheney recently, writing a book. 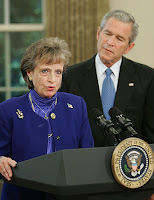 My favored portrait of Miers and Bush, announcing her candidature for the Court. Bush, just after his election for a second term, was confident, that he could do anything he wanted. Poor Miers was his first victim then. 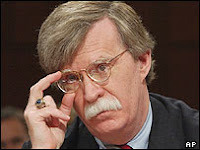 Bolton - another victim of Bush' hubris. We are waiting for HIS version of what happened. His neocon friends at the Weekly Standard already let Bush' handling of Iraq and the Middle East down. What is he going to say for himself? In Iraq itself, Allawi was abandoned, as well as that great friend of the neocons, who was to be president of the new Iraq, Achmad Chalabi, of whom we did not hear much, these times. Allawi with friends, 2004, in the provisional authority of Iraq, at the signature of the new Iraqi Constitution ceremony. 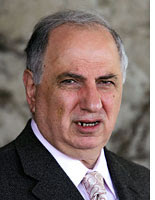 Achmad Chalabi, master intriguer, who, as an Iranian agent, bedeviled all NeoCons in Washington. Was to become the first president of American Iraq, but ousted, when the Pentagon, who paid for his non-existent movement, discovered the truth in April 2003. Was offered a prominent seat behind president Bush when he gave his State of the Union in January 2004. His ties to the Mollahs were discovered, and, spring 2004, his offices raided by American troops. At this moment, he is biding his time, somewhere behind the screen of Grand Mollah Sistani. Who will be the next on the list? Mr. Balkenende, Dutch prime minister since 2002, is a fair candidate. A parliamentary commission will soon be created to research into his stubborn refusal to reveal the "personal", "for your eyes only" letter that he says, Tony Blair sent him in 2003, to make him join the Iraq coalition. Balkenende with Dutch military in Afghanistan, 2006. And what about the Polish twins? Poland set high hopes on its substantial contribution to the Iraq occupation. It was bitterly disappointed to discover, that all interesting contracts went to US firms. The former government was busy to reduce their implication to zero. The new, ultraconservative government resulting from the last elections froze that. Polish public opinion is vehemently opposed to the Iraq adventure. Will they stumble also over their alliance with Bush? 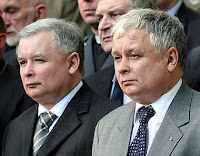 The twin Polish president and PM - next victims? We may have missed some victims of Bush' mess. But it is an impressing list as it is.